Green Earth Roshni School is located in Hayr on Bedian Road, around 2 km from Roshni Village. It was launched as a joint effort by Roshni Association and Green Earth Recycling in 2005. Not only did the school receive its name from the Green Earth Recycling Factory but also their building and donations. Our school provides meaningful education to more than 160 students of the local area and offers co-education from Kindergarten to Grade 8. Being based on the concept of Waldorf education, the students develop a free and socially responsible approach towards life. In Green Earth Roshni School, the aim is to support the physical, emotional and intellectual growth of the children. The students are given time to discover the world and to learn at their own pace. This non-competitive environment is a fundamental principle of Waldorf pedagogy. The lessons have a rhythm, structure and purpose to make them more effective for the children’s learning. The first lesson starts with prayer and then they recite poetry with music and eurythmy (artistic movement). The purpose of this lesson is to develop and train concentration and coordination in a playful way. It improves balance and coordination in their bodies and stimulates and enhances their expressive capacities. The following two hour “Main Lesson” explores a single academic subject in depth over about a month’s time. 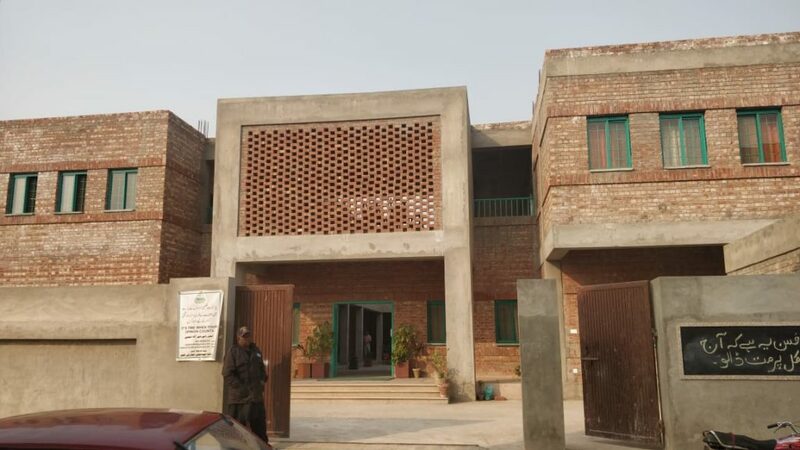 The students are taught Mathematics, Urdu, Geography, English, Religious Studies, Arts & Crafts and Drama, including Sufi songs and recital of Allama Iqbal’s poetry. There are few textbooks. The teacher uses a narrative style in lessons to develop better communication between the student and the teacher. 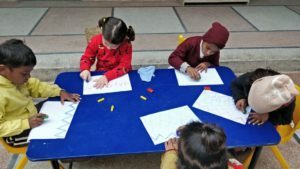 In primary classes, pictorial and imaginative learning methods are used to give the studenta an opportunity to become more creative in their thought process. 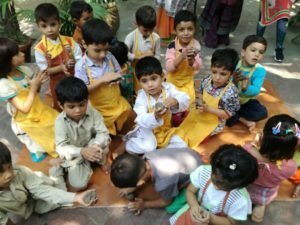 In Green Earth Roshni School, the Waldorf school curriculum is modified and adapted to the culture and traditions of the country and the needs of the children. As in other Waldorf schools, artistic and creative skills are also essential parts of the education in our school. Through painting, drawing, clay modelling and wood work, the children develop a sense of proportion, balance and clarity of thought. The rhythm of the year and the seasons are integrated in the curriculum. Through farming and gardening on special occasions our students gain a deeper understanding of nature while learning valuable techniques. These are abilities they will profit from in their entire lives. Kindergarten is the first place to learn. Green Earth Roshni School has a very distinguished kindergarten which gives children a warm and protective environment to learn and play. Our kindergarten or pre-school is a place of creativity for children aged four to five years. Love of the language and the spirit of self-expression are encouraged and supported through story telling, singing, painting and other activities. Substantial time is given to play freely, to support the physical, emotional and intellectual growth of the children. They learn while playing and enjoying themselves. As at this young age children are full of fantasy and ideas, all the toys and dolls given to them are made of natural materials and designed to stimulate the imagination to give them names and characters. They are allowed to develop their own games and be part of their own stories. The kindergarten teachers fully participate in all these activities and encourage the students to express themselves. At this tender age children are sensitive to their environment; therefore, we try to keep our kindergarten a place filled with love and care. A rhythm is developed for the regular tasks. For example, there is time for storytelling, singing and doing regular household chores like cleaning and cooking. Students are also involved in stitching and weaving to develop their gross and fine motor skills. Green Earth Roshni School provides free lunch to the kindergarten students. The lunch is prepared by the children themselves with the help of their class teachers. This helps them identify and name common things used in their homes. To keep them closer to their natural and cultural environment, different seasons and events are celebrated in the class. The students decorate their room according to the nature of those occasions. 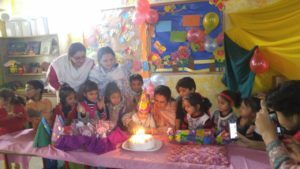 Kindergarten in Green Earth Roshni School is a place where mothers of the local area feel safe to send their small children for their healthy development. 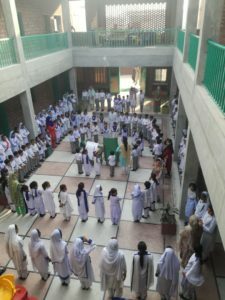 As there were few schools working on educating the children with special needs in this area, Green Earth Roshni School took an initiative to start a project to improve the education-related services provided to the local community. 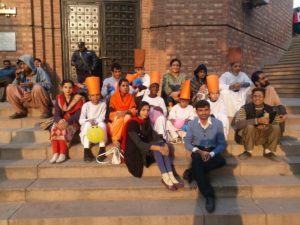 Therefore, in September 2013, an inclusive education programme was begun in the school, in collaboration with Amin Maktab, an institution of Lahore for special persons. Initially, three students were enrolled in the school and now the number of students have been increasing every year. Due to this programme, we do not have to deny admission to any child because of his or her disability. All students are treated equally In Green Earth Roshni School. Depending on their IQ level, the special students either study with their age fellows or they are taught the same syllabus by their trained inclusive teacher. To develop gross and fine motor skills in these children, the teachers engage them in a variety of special handwork activities like gardening, weaving, clay modelling etc. Our special students are admitted and regularly assessed with the help of Amin Maktab. Unfortunately, due to lack of awareness, we still face reluctance from the parents to admit their special children in the schools. We are trying our best to overcome this problem by encouraging the families of the students to propogate the benefits of education for special persons among their neighbours and families.